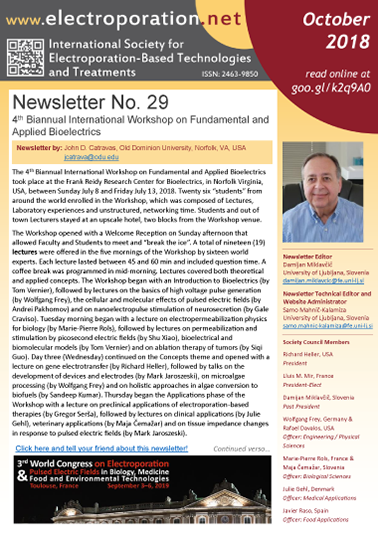 This month’s Newsletter reports on the Workshop on Fundamental and Applied Bioelectrics held in Norfolk, Virginia, USA in July, 2018. The Workshop was organized by John Catravas and colleagues at the Frank Reidy Research Center for Bioelectrics. The report was written by Dr. Catravas. what the cost of registration would be for ISEBTT members. The letter should also include information on the budget for the School as well as disclose other sources of revenue. The school will also be advertised to ISEBTT members via the Newsletter and web page. school/workshop needs to be more than a local class for in house students of the host Institution.